Right now, I have corn in my teeth. I just got back from a barbecue. I just hung out with friends from the Denver Comedy Works staff plus a few of their friends. I caught up this improvisor girl I know. She shaved her head a few months ago. That's customary when you cross the equator for the 1st time. She just did a 6-month educational cruise. Cool. My friends and I hung out at this gazebo at Cheesman Park, a notoriously gay Denver Park- also, a conveniently/ centrally located Denver park. We went there because it was convenient, not because it was gay. We did eat a ton of hot dogs, though. While we were chilling, this guy showed up and took his shirt off. He did push-ups in our periphery. Then he rotated around the gazebo/ us and did another work out. He kept looking at us. He rotated again and did a different exercise. This time he grunted. My friends and I eventually noticed that he kept rotating around our group. He circled us 4-5 times. It started getting weird. He kept looking to see if we were watching him. How could we not? He was creepy! Anyway, I did not go to my Bender's open mic tonight. My roommate's band, The Murder of Crows is playing. However, I am super-tired. Yesterday, I flew back from Atlanta. I was in the 2nd Annual Laughing Skull Comedy Festival. It was a blast, but I am wiped the hell out. Great. My roommate just told me the toilet is broken. Which should I procrastinate first? The toilet or this blog? Both are swimming with turd content. Submissions for the 2011 Laughing Skull Comedy Festival took place in fall 2010. In October, 2010, I found out they selected me for the competition. In November, 2010, I competed in a preliminary, satellite round which took place in Seattle, Washington. If you read my blog, then you know I was already up there doing the Seattle Competition and about 7 weeks' worth of work. The festival had satellite competition rounds all over the country. If you took 1st or 2nd at those rounds, you made the quarterfinal round, hosted by the Laughing Skull Comedy Club in Atlanta, Georgia. I did not make the quarterfinals. On March 10, 2011 Laughing Skull Festival coordinator, Steve Hofstetter sent out a mass e-mail to everybody who was selected for the festival- even those who didn't make the quarter finals. Hofstetter said there were still spots on some of the satellite shows and if we wanted them, we could hit him up. He offered sets for the political show, the jew show, the storytelling show, the family show, the gay show, the chick show, and the racial show. To get on one of those shows, you had to fit the category and sign up on a first-come, first-served basis. I had never written a political set before, but I told him I was super-political anyway. I also told him I was Jewish and racial. I wasn't qualified for any of these things, but sometimes you just have to fake it till you make it. Besides, if you go back far enough, aren't we all Jewish? Steve gave me a set on the political show. Cool. I love a good challenge! Moreover, I love writing for a specific topic. When Chuck Roy used to run the Stand-up Comedy Battles here in Denver, he used to give each competitor several topics. We'd get 1 week to write jokes for each of them. Then, we'd go up against a competitor in our division (lightweight, middleweight, heavyweight) and then we'd face off against an opponent. after each topic, the audience would applaud their decision. We fought for the best out of 5 rounds. Some of the jokes I wrote for those battles ended up in my act for a long time. Most importantly, I told Steve I could do the political show because I have had a passion for my political beliefs for a long time now. I just knew a month was enough time to get 6-10 solid minutes of new material. I wrote jokes for that set everyday. I ran that material at any and every open mic, showcase, and gig I could get on. If something wasn't working quite right, I fixed it or ditched it. I probably ran that set 40 times. The local open-mic-ers probably got super-bored of that set! Tough. The Denver clubs were super-supportive. After I had narrowed down about 10 minutes of material, I asked Wende Curtis, the owner of Denver's Comedy Works for some showcase sets. I got 3 of them opening for Jim Jefferies. Thanks, Wende! Then, I asked Westminster's club, Wits End Comedy Club for a set. No problem. I did their 10:30 show Saturday, a week ago. Thanks, John and all the Wits End crew! The festival started Wednesday, April 6. However, I decided to fly out on April 7. My political set was April 8. On April 6, I ran the set 1 last time at Comedy Works. It felt good. I came up with 1 more tag that night, too. Sweet. I didn't do as much preparation for this set. I only found out I was doing this show a couple weeks ago. However, when the opportunity presented itself, of course I signed up! I wasn't going to go all the way down to Atlanta and just do 1 set. Screw that! Moreover, I like telling a good story. I am an avid listener of the Moth Storytelling Podcast. I was an English major, so I write a lot. My dad always tells great stories. It's just in my genes. Lastly, I am an improv actor. If worst came to worst, I knew I could cover myself. So, I signed up. I took 2 hours and wrote out the story of the time I got cuffed at work. Then, 2 weeks ago, I ran the story, notes in hand, at "Too Much Fun," a comedy variety show run by a group of comedians known as "The Fine Gentleman's Club." The show was just okay. It was the 1st time I ever told story to an audience. Plus, regardless of my performance, half the crowd was in the back of the room talking through everybody's set. I found some of the things I had written were too long and unnecessary to tell the story. I also found I riffed a lot of the funniest parts of the story. So, I cut the story way down. Then, I asked Andrew Orvedahl if I could do "The Narrators" show on April 6th. "The Narrators" is a storytelling show modeled after The Moth Podcast. Comedians and performers of all types get 10 minutes to showcase a story that fits the theme of the night. The stories could be serious, funny, or whatever. This time I ran the story without notes, without a script. I forced myself to just tell the story with the knowledge and trust that I'd take care of myself. The audience was much more engaged this time. I found new laughs. I improvised jokes and call-backs. I recorded my story-until the battery on my crappy voice recorder died. The next day, I flew out to Atlanta. Travel is expensive. Even in crappy, podunk towns, hotels cost $100+ per night. In places like Atlanta, forget about it. Fortunately, the fetival worked out a deal with the Hotel Midtown so participants could pays a discounted rate of $75 per night. After tax, that ends up being about $90 per night. I made a reservation, but I also made a 2nd plan: I hit up some folks on couchsurfing.org. Couchsurfing.org is a great resource for travelers. Those of you who read my blog know that I have stayed on couchsurfer cloors and couches across the country. That's what I did for the Boston Festival and that's what I keep doing in Dallas and other places. It's free, but you're not a free-loader. You go there and hang out with your host. The point of the site is for you and your host to have a cultural exchange. So, I lined up a couch. I was excited to meet my host. However, those plans fell apart. The day before going to Atlanta, I realized I had forgotten to give 24-hours cancellation notice for my hotel. Crap. Fortunately, I called the hotel and they let me cancel anyway. However, my host told me he would be home that night at 7:30. I was getting in at 4:00. I didn't want to roam around with all my luggage for 3.5 hours. Plus, travel days wear you out. I knew I'd need a nap. I knew that I wanted to rock my political set the next day so I had to make sure I had all the alone time I needed to rest, do yoga, and get zen before my performance. I am not super-funny or chatty before certain sets. Sometimes, I just like to be. So, lastly, I didn't think I'd be the best guest. I needed me time. You can't hang with people who want to be alone. Plus, the festival had 4 parties. I'd be staying out late, getting up late, and going to do my thing. There would be no time to chill with my host. So, I called the hotel again. they let me un-cancel. Sweet. I was on a budget, so I didn't want to leave my car at Denver International Airport's long term parking. I couldn't afford a cab. I really didn't want to lug my luggage all over downtown at 6 am to catch the RTD Skyride, the bus that goes to the airport. The RTD Skyride's closest stop to me was at the Greyhound station, a perfect place for homeless transients to heist my laptop, luggage, travel cash, or even just my lotion. That sounded crappy. Fortunately, my buddy, D is a special ed teacher and his school is out by the airport. He said he'd give me a ride. Cool. Unfortunately, he has 2 phones and he answers 1 of them all the time and the other 1 sometimes. I used to have his good number but when he got his new phone, that became his bad number. When he texted my his new number, he didn't identify himself. He just sent me some dirty texts. Gross. Who is this? So, I didn't have a good way of contacting him. Also, I stayed up alte the night before my trip because I had to pack. Also, I had been staying out late a lot lately. So, the day I was supposed to leave for Atlanta, I slept in. I forgot my alarm. At 6:10, he calls me to say he'd be there in 5. Crap! Fortunately, I packed and showered the night before. I just had to get dressed, brush my teeth, and gather all my stuff. I hurried, but it takes me awhile to get ready when I've just woken up. He was getting antsy. He kept sending me "Hurry-up" text messages. Fortunately, my phone was in my pocket so I did not get them. I was already rushing. Acting like a chick wasn't helping me rush, D. It's not like I was just sitting there watching a movie- though I have been late because of that before. This time, though, I was rushing. I am a major believer in breakfast, but I skipped breakfast that day. I didn't even make tea. I just rushed out the door. At least he didn't leave me. He drove me to the airport. Then he stopped before he got to my airline. "Get out." I was like "It takes the exact same amount of time to just take me to my airline." "Get out." Okay, then. Me: "Did you make your student-teacher meeting okay?" D: "I was on time, but the student was re-tardy." I got a crappy bagel at the airport. I asked for hot water. They gave me some- for free. I brought my own tea bag. I saved $2. Unfortunately, staying at the hotel drastically affected my budget for the week. I went from paying $280 for my flight and about $100 for food and entertainment to about $250. Dang. Moreover, the hotel charged me a $150 deposit (which they never previously warned about). My card maxed out. Crap! My week ended up costing me about $700- and I wasn't working. The lady at the hotel was super-nice. In fact, she was the nicest 1 there. I wish I knew her name. It had too many letters for me to remember. She was black, pretty, helpful, and mouthy. She was cool. I have 1 quick complaint about the hotel. . Now, I don't wish to mention the name of the Midtown Hotel because I don't know what kind of business arrangement the Laughing Skull Comedy Club has with them. So, let's just say I stayed at an anonymous hotel. At1st glance, the anonymous hotel looked great. However, my equally anonymous buddy- who asked me not to tell people he complained about this - cause he knows I lack discretion- he said he thought the hotel was crap. He complained about how all the fixtures haven't been updated and that was a clear sign the hotel itself wasn't updated. I had no idea what he was talking about. What the hell does a fixture have to do with anything? I am not even sure I know what a fixture is! I looked around and it looked nice. Whatever. I did notice that they didn't have wi-fi. every piece of crap motel I ever stay in has free wi-fi. Some might not have free breakfast, but most hotels pay the internet bill and have the income to buy a few wireless routers. Come on! This was a business-class hotel! How can you not have internet? They did have ethernet internet- so I could finally use that lonely slot on the side of my computer again- but that internet cost $10 per day and was as slow as the unprotected wi-fi I was heisting from the building next door. Lame. I didn't eat on the plane. I didn't eat at the Dallas-Fort Worth airport during my brief layover. There just wasn't time. All I had eaten all day was a crappy, un-toasted bagel. So, when I landed in Atlanta, I was starving. The train from the airport to the hotel took a 20-minute break before we even left. Then it left. Then it took 30 minutes to get to the hotel. By the time I got in, I was starving. I called my friend Troy, a Denver comedian who was also at the festival, and asked if he was hungry. After I got settled in there, we went to the Flying Biscuit, just down the street from the hotel. Deacon Gray, Denver comic had recommended the place. It was awesome. I ate 3 slices of bacon, a side salad, a biscuit with apple butter, and the main course was biscuit pot pie- which was basically 4 biscuits surrounded by a sea of "Creamed chicken, carrots, celery, onions, potatoes, and peas. A modern twist on an old Southern classic. 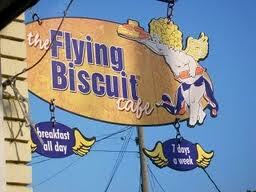 "- http://www.flyingbiscuit.com/Menus.aspx After eating 5 biscuits, all those ingredients, and a salad, I was stuffed! I had what black people call "The itis." I needed a nap I was not going to get. that food was delicious, but I was dozy and my stomach felt like it was churning concrete. After tip and tax, I spent about $17. After my breakfast, flight, and my hotel room, so far I had spent about $700 on this trip so far- and I had just gotten to town! Troy spent $15 or so there. He had ordered the pancakes. He wanted buttermilk pancakes, but they only had oatmeal pancakes. He ate half of them and said he didn't like them. I think I would have liked them, but we all have our own tastes. Despite my itis, Troy and I went to Laughing Skull Lounge to see the Thursday 8:00 competition round of the contest. The room held maybe 120 people- maybe less. The round was stacked. Everybody was super-funny. Ari-Shaffir went a over his time- in theory, they penalized him for that- but it didn't matter because he had the set of the night. Ari was very funny! I am really glad I got to see his set. He took 1st place in that round so he moved on to the semi-finals. Congrats, Ari! Margaret Cho closed the show. She was a surprise guest. I was wondering how they got her to perform in such a small room. Turns out she lives there now. Cool. Because I had already spent so much that day, I only had $2 on me. When the waitress came by, I asked for a water. I was planning on tipping her both dollars. The rule is, it's always $1 per drink or at least 20%, whichever is higher. However, she showed up with a 5-ounce bottle of water and asked for $3. I tried to give her my credit card. They only took cash there. No problem. I told her meant I wanted a glass of water. She told me there was a 2-item minimum. Typically, patrons must obey that rule. Just like movie theaters, clubs rarely make their money off the show. Clubs usually make their money off drinks and food. So, I understood where she was coming from. I was in her section not paying for stuff. However, I am a broke comic. We never do the 2-item minimum. Also, I just spent $700 to work for free. Anyway, no biggie. I was still full after the 8:00 show, so I did not go to the 10:30 show. I wish I had. I heard my Twin Cities pal, Andy Erickson crushed it. I heard she just murdered! She took the round and went to the semis. Congrats, Andy! Like a lot of other comics, I mingled at the bar. They had a party that night at the Claremont Lounge, a gross stripper club known for its gross, sextagenarian strippers. Apparently it is an Atlanta landmark. I did not go. I hate smoke. I don't like strippers. I definitely didn't want to see their 65-year-old strippers. Plus, I was tired. So, I went to bed. The next day I heard about a gross stripper named peaches who showed her peaches and her peach cobbler. Yucky. Glad I missed that. Well, this is basically all I can really cram into a single blog entry. I have broken this adventure into 3 parts. I'll publish parts 2 and 3 tomorrow, 4/12/11. I'd do it right now, but I am super-tired. Anyway, the best parts are yet to come. Everything I have mentioned so far is about travel, lodging and other people. The real meat comes in the next 2 entries as I talk about the people I met, crackheads, the Bulldog, hostile environments, injuries, despair, and stuff.